Chess Evolution Premium clock is a FIDE approved digital chess timer. All official FIDE time controls are pre-programmed in the clock and any other time-controls can be-set up manually. The settings can be also changed manually (for example extra time after move 40 will be added when the flag falls or after completing the 40 moves, etc). The clock is very stable due to its wide grip on the table and has a modern, aestethic design. It is working with touchscreen controlling, upgrading the chess technology to the 21st century! - all clocks can be started from the computer in the same time (even on huge open tournaments, the arbiter can start each clock in the same time) and many more innovative functions, which bring chess to a higher level! 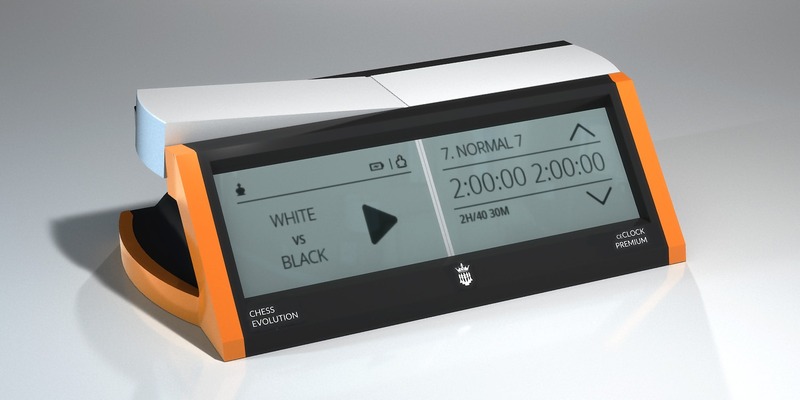 Chess Evolution Premium clock has an easy and user-friendly usage and together with our digital chess set (CE E-Board & CE E-Pieces) it is available for live transmission either via Wireless Station (CE Wireless Station) or with cables via CeConnect converter (CeConnect). Chess Evolution Premium clock is working with an accumulator. In case of live transmission, it gets automatically charged, while in case of standard usage it has 250+ working hours with one charge. Charging time is: 2,5 hours.